NGC 4151 is a spiral galaxy with an actively growing supermassive black hole at its center. 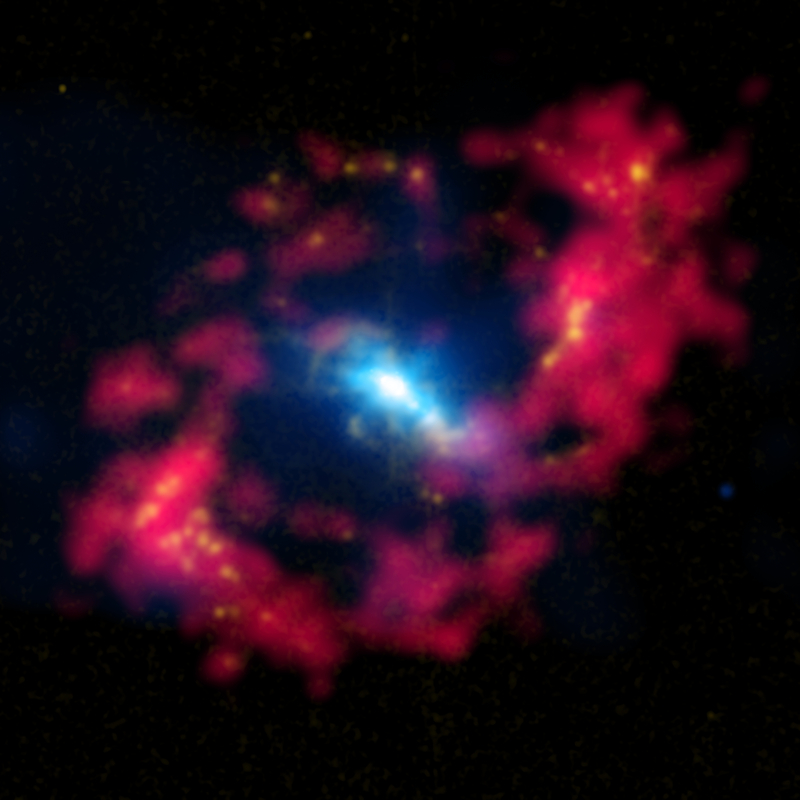 This composite image of NGC 4151 contains X-rays from Chandra (blue), optical data (yellow), and radio emission (red). The structure has been dubbed "The Eye of Sauron" by astronomers due to its resemblance to the character in "The Lord of the Rings" movies. The second possibility also involved a substantial inflow of material into the black hole relatively recently. In this scenario the energy released by material flowing into the black hole in an accretion disk created a vigorous outflow of gas from the surface of the disk. This outflowing gas directly heated gas in its path to X-ray emitting temperatures. Unless the gas is confined somehow, it would expand away from the region in less than 100,000 years. In both of these scenarios, the relatively short amount of time since the last episode of high activity by the black hole may imply such outbursts occupy at least about 1% of the black hole's lifetime. NGC 4151 is located about 43 million light years away from the Earth and is one of the nearest galaxies that contains an actively growing black hole. Because of this proximity, it offers one of the best chances of studying the interaction between an active supermassive black hole and the surrounding gas of its host galaxy. Such interaction, or "feedback", is recognized to play a key role in the growth of supermassive black holes and their host galaxies. If the X-ray emission in NGC 4151 originates from hot gas heated by the outflow from the central black hole, it would be strong evidence for feedback from active black holes to the surrounding gas on galaxy scales. 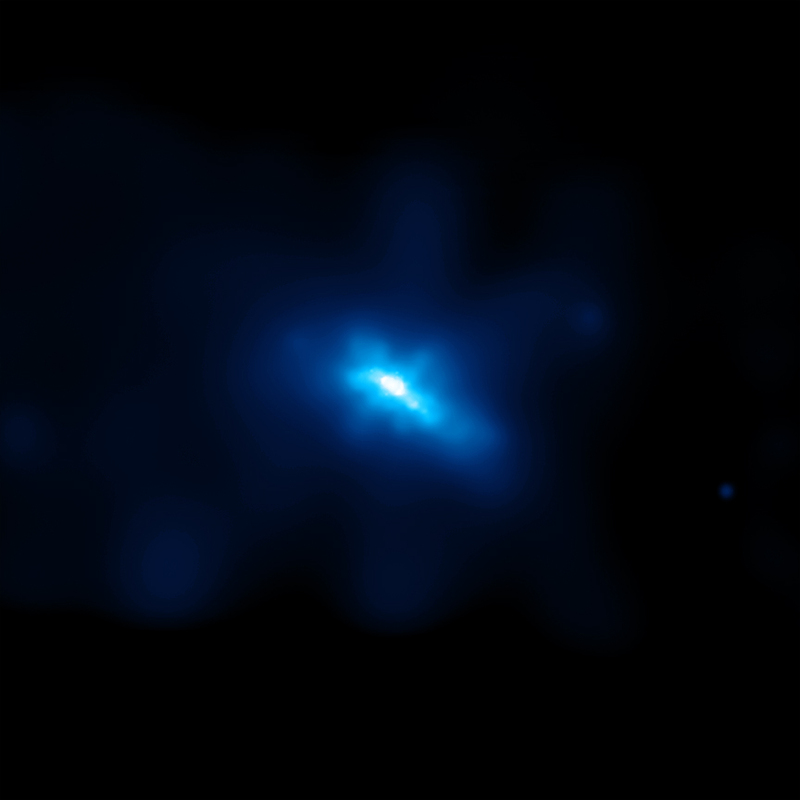 This would resemble the larger scale feedback, observed on galaxy cluster scales, from active black holes interacting with the surrounding gas, as seen in objects like the Perseus Cluster. These results were published in the August 20, 2010 issue of The Astrophysical Journal Letters. The authors were Junfeng Wang and Giuseppina Fabbiano from the Harvard Smithsonian Center for Astrophysics (CfA), Guido Risaliti from CfA and INAF-Arcetri Observatory, in Firenze, Italy, Martin Elvis from CfA, Carole Mundell from Liverpool John Moores University in Birkenhead, UK, Gaelle Dumas and Eva Schinnerer from the Max Planck Institute for Astrophysics in Heidelberg, Germany, and Andreas Zezas, from CfA and the University of Crete in Greece. Coordinates (J2000) RA 12h 10m 32.60s | Dec +39° 24' 20.40"
It would be interesting to add a gamma ray image from Fermi telescope. This is a great place to come to so much information with such exactness. Apparently, from what I have been reading on the subject of Black Holes, there are more galaxies with one than galaxies without them. Most interesting article. Educational as always. I am still impressed by the advances in astronomy. It is hard to comprehend the vastness of knowledge. Looking back some many light years ago, I was Steve Murray Joe Swider, and Gerry Austin's PLANNER on the design and development of the Chandra HRC Program. What a program, even today, I am thrilled when I receive daily news of our journey into deep space. Awesome, I have since gone into a hard earned retirement. Hello, to all of my friends including Harold T. NASA Blood Still Runs Thru My Veins. Try photographing the black hole with many kind's of sodium filters and spinning rapidly slow-light gels and see what slowed down photons respond like. The central region of the spiral galaxy NGC 4151, dubbed the "Eye of Sauron" by astronomers for its similarity to the eye of the malevolent character in "The Lord of the Rings". 43 million light years from Earth. About 37,540 light years across. X-rays are blue, the radio data are red, and the optical data yellow. In the constellation Canes Venatici, visible in the Northern Hemisphere.